The long-awaited Interstate 680 freeway completed its Walnut Creek-Danville section in 1964, following a route through the middle of the San Ramon Valley. In the meantime debates over the precise freeway alignment through the small village of San Ramon were heating up. 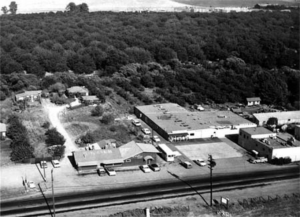 In the early 1960s, county planners were working with the Greater San Ramon Improvement Association to generate a Master Plan. The planners made it clear they thought the old buildings in San Ramon were real eyesores. In that era, saving historic buildings wasn’t something that usually came up. In 1963, the San Ramon Fire Department even burned down the classic 19th century San Ramon General Store as a practice for its firefighters. Russ Griffith, the principal planner for the County Planning Commission, suggested that the new freeway should demolish the buildings east of the Old Highway, including the Brass Door, San Ramon Motors, San Ramon Realty and the A&W Root Beer restaurant. He reasoned that San Ramon’s downtown could have a new start. Up-to-date buildings such as the immensely popular Sun Valley Mall in Concord opened in 1967 and “modern” was definitely in vogue. Loud meetings with 200 or more people focused on the freeway location, and the Valley Pioneer for Sept. 19, 1962, said the county proposals were “causing havoc in the area.” These were large meetings for an area with such a small population. Congressman John Baldwin and Assemblyman Don Doyle heard from San Ramon leaders and helped guide the freeway away from the downtown, although the east side of one building south of the Brass Door was clipped off. Because the area was still so rural and federal regulations opposed ramps closer than three miles apart, only a Crow Canyon Road ramp was planned. Norris and Bollinger Canyon Roads had freeway overpasses. Built by Frederickson and Watson, the 5.9-mile section of freeway from Sycamore Valley Road to Dublin was under way by 1965. On Sept. 24, 1966, “Double D Days” celebrated the freeway linkage between Danville and Dublin. Historian Wilson Close headed the DD Freeway Celebration, which included an antique car parade with pioneer descendants Matilda Hartz Elliott, Friederiche Jackson and Leo Norris in the first car. Other dignitaries included Congressman Jerry Waldie, State Sen. George Miller and County Supervisor James Moriarity. What changes the freeway brought! No more cars end-to-end throughout the valley, and people could get in and out of town easily. The relief from congestion gave local leaders hope that gas stations along the highway might be replaced by other businesses. With the Danville-San Ramon- Dublin link completed, the DD 680 brochure bragged that motorists could completely circle the entire East Bay area in a 73-mile loop without having to stop for one traffic signal. There were congratulations all round.